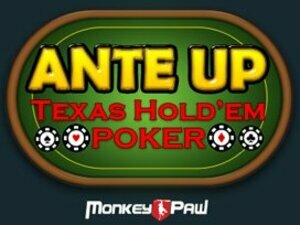 Ante Up: Texas Hold'em is one of the better poker games available on DSiWare, and now we have five copies of the game to give away to DSi owners in North America, coinciding with the happening-right-now World Series of Poker. If you want to win the game, be sure to follow MonkeyPaw Games on Twitter and follow Nintendo Life too. Done that? Now just leave a comment on this post with your Twitter username and a few words about why you love poker. If MonkeyPaw likes what you have to say, you could find yourself the lucky recipient of a free copy of Ante Up: Texas Hold'em on DSiWare. Couldn't be easier! Remember, you must own a North American DSi to win this competition as codes are for the North American DSiWare Store only. The competition closes on Monday 18th July, so be quick. In case you're not sure why this is such a good deal, read our Ante Up: Texas Hold'em review. Why do I like poker? Because it's challenging. I love the feeling you get after having outsmarted everyone else in the table and getting all of their chips. There's just nothing like it. Some people like to do crosswords. Others like to play Sudoku. I love to play poker. I have ZERO DSiWare games on my 3DS so this game, if I were lucky enough to win, would be the first! Cheers! The reason I like poker is the getting together with friends. It's a fun past time we do, and it brings us together closer through the power of competition. And if poker didn't exist, neither would this contest. I love poker because my 6-year old sister gets dirty rich whenever we play, and draws full houses 90% of the time. The rest of the time she gets a royal flush. Next year, we're taking her to Vegas! It brings the family together when we engage in a friendly match of poker. I like the game of poker because of the skill, tense moments, pressure and even whether or not the other players take a chance on whether to risk it all or call someone's bluff. I want Pandora's Tower for my Wii! and also I like poker because there I can use my poker face: ._. I like Poker because it involves skill as well as luck. By playing poker, I've increased my math skills, and have started learning how to read other players based on their bets. Stink! Now I really wish I had twitter. But, I'll still give my reason why I like poker. Poker is a very unique game. Not only does it have chance, it does involve some skill. I first became a poker player when I was at a new year eve's party. After playing a little (and failing), I started playing it on the internet. That helped me alot, and nowadays if anyone has a poker set, I challenge them (and usually lose )! Twitter is free to sign up Portista. I'm a big poker fan because I like how it is a card game that incorporates a lot of psychological strategy! A great portable poker game should give you that feeling of excitement of actually being in a good poker game/tournament while on the go. Ante-up can give that dose of perk anytime of the day by offering a simple yet robust poker game for everyone. I have a friend who is crazy about poker, i would love to get a good poker game so I can beat him next time. Wryan_Wryan... I have loved Poker ever since my uncle Charlie and cousin CJ made me play so they could laugh at how bad I sucked at it. Since then I have gotten a lot better and can not get enough of it! Have many apps on my droid and play it on Facebook also. I like video game poker, because you have the excitement of managing and wagering your money while trying to outthink your opponents, but there's no real money involved to worry about losing it. would anyone rate Texas Hold'em poker as the top card game? Well, i'll definately do so. That is because poker is actually an addicting game, not like solitare. Solitare could get boring after a while but I've never got bored from this wonderful game. And what makes me love this game at most is that you must use your logic and skills so that amount of chips could agree to sit in your hands. In conclusion, having such a brilliant Texas Hold'em title on a portable device is actually something really cool to have ready on your dsi, and what's even better is that the idea of giving five copies to five, lucky dsi-owners was actually a brilliant idea. Good luck for who ever wants a free copy of the game! didn't get any email on this so anyone here able to win the game? congrats! @slidecage: tap the 'add points' button. it'll give you the option to either use a credit card or redeem a code.